The Parliamentary Portfolio Committee on Industry and Commerce has begun visiting the country’s manufacturing sector to appreciate the challenges it contends with, so as to prod Government to intervene with matching solutions. This was said by the Portfolio Committee’s chairperson Mr Joshua Sacco in an interview with The Herald Business in Harare yesterday after touring Dairibord Zimbabwe Limited (DZL)’s Rekayi Tangwena plant. The initiative comes at a time when the Ministry of Industry and Commerce is also touring companies that were destroyed and/ or looted during the January 14 to 16 violent demonstration instigated by the MDC Alliance and its partners in the NGO and civic sectors, to establish the quantum of assistance required by the affected firms so that they can be capacitated. Mr Sacco said the Portfolio Committee’s tours will start by focusing on the food industry, before being extended to other sectors. Said Mr Sacco: “As the Committee on Industry and Commerce, we have resolved to visit industries in different sectors. So we have started with the food industry, we have done Dairibord today, just to understand the challenges and the direction which they are going and how Government can also come in to facilitate an environment which is conducive for them especially around issues of producing local products in Zimbabwe. DZL chief executive officer Anthony Mandiwanza, told the parliamentarians that the company, which has a market capitalisation of $62 million, is being hampered by a number of challenges principally the decline in national milk production. 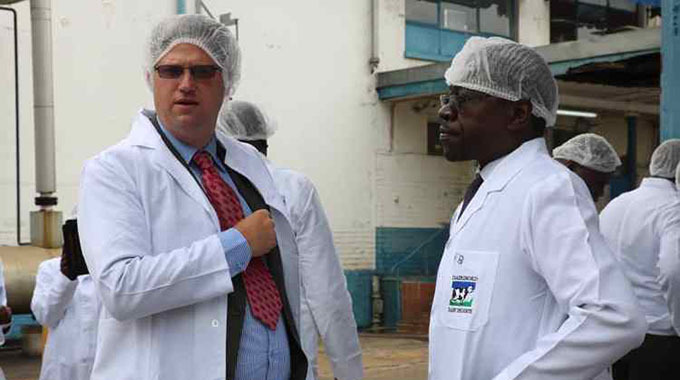 Due to the shortage of milk, a key raw material for their business, DZL has mothballed operations at its Bulawayo, Gweru and Kadoma plants, while the Chitungwiza plant has moved to making maheu. Milk production sharply declined from 260 million litres in 1999 to 39 million litres in 2009. Said Mr Mandiwanza: “By the year 2008 into 2009, milk production had dropped from the peak of 260 million litres to 39 million litres. Worryingly, milk production declined at a time when the sector had been deregulated, and now boasts of over 15 players. During the time of high production in the ‘90s, there were only two milk processors; Dairy Marketing Board (DMB) and Nestle Zimbabwe, with DMB consuming 90 percent of the milk. Mr Mandiwanza said the diminishing milk production base comes against a backdrop of Government — previously a shareholder in DZL — having had invested significantly in infrastructure such as a brand new dairy in Bulawayo, a completely refurbished dairy plant in Gweru and a cheese making plant in Kadoma. The new plant and equipment at the Harare plant was producing ice-cream, yoghurts; with the Chitungwiza plant having been designed for 300 000 litres of milk per day. “We had massive excessive infrastructure against a diminishing milk supply base, to the extent that the national milk production had dropped to 39 million litre by 2009, and with many others having come on board. “So, today as we are talking, there are only two major processors who have remained on two feet (and) the demand for milk as at last year is 120 million litres (per annum) and the supply side is 70 million litres, which means a deficit of 50 million litres. “Now, when you have a deficit of 50 million litres, you ought to ask the question, ‘so what is happening between the demand and the supply?’” said Mr Mandiwanza. He said the industry has been furiously importing powder and butter into the country at a cost of $7 million a month. “This is a very important issue for your Committee . . . which then speaks about the competitiveness of that industry going forward. “When you have a demand or supply gap that is being plugged by importation of powdered milk, it means the country is consuming foreign currency and yet you have got scarcity in foreign currency,” said Mr Mandiwanza. The dairy sector is spending $7 million per month, which could be more given that some unregistered firms could be importing too, at a time the ability to export and earn in foreign currency has disappeared due to low milk production. Mr Mandiwanza said foreign firms are sending their products to Zimbabwe due to the attractiveness of the US dollar, which when converted in other countries, fetches more.